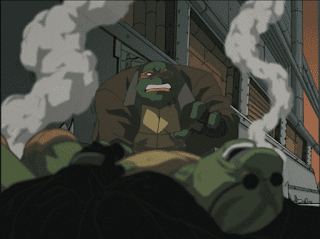 My review for TMNT (2003) Season 3, Part 4 is up over at AIPT! Season 3 really brings its A-game in the backend. "Time Travails" and "Hun on the Run" are great (especially the latter, which has possibly the best fight scene in the series). While the "Return of the Ultimate Ninja" arc gets off to a bumpy start with some dull Super Turtles and Planet Racers crossovers, it goes full throttle when it hits "Same as it Never Was". Hope to finish up season 3 soon; possibly before the site's 10th Anniversary at the end of the month. I always thought the late Season 3 episodes might have been the high-water mark for the series, at least in regards to animation quality.